'A la voix d'un amant fidèle', a melody heard more than once in the score which Huw Rhys_Evans infused with gentle persuasion and ringing ardour in a performance notable for his firm articulation of the words and projection of the notes. The Welsh tenor Huw Rhys-Evans, a protégé of Alberto Zedda, has a good voice with enough weight and juice to make me wonder about his chances as Manrico or Ramedes in a few years from now. Huw Rhys-Evans steals every scene he is in. Of the excellent quartet of soloists, two shone out especially for me the tenor, Huw Rhys Evans, and the soprano, Linda Gerrard but the contribution of mezzo Kathleen Wilkinson and Paul Keohone, bass, must not be underestimated. Evans was an evangelist to die for, his voice ideal for the role. His recitatives were clear and precise, his arias perfection, despite a brief eclipse by a wonderful flute obligato in Haste Ye Shepherds. 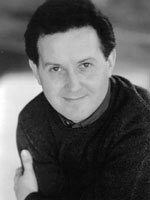 Also imnpressive was HUW RHYS-EVANS as Filippo, who made an instant impact in his Act 1 aria when he orders his daughter to marry Nencio whether she likes it or not. His conveyance of the text was the best of the five, in fact allowing us to hear every word without straining. As Pilade, Oreste's friend, we heard Huw Rhys-Evans, who had been the worthy, late-replacing tenor in the aforementioned Semiramide. He had less to sing here but enough to show that he also could take such music in his stride. It was good casting all around.